Operated by Korea Tourism Organization, the tourist information centre at Korea Plaza provides you with information on tourism in Korea. All brochures, maps and travel guides are provided free of charge (please note that the brochure mailing service has ceased). Visitors can approach any staff if assistance is required. As a neutral organization, we are unable to recommend specific accommodations or travel agencies. Under the Travel Agents Act (Chapter 334), we are not able to make any bookings or reservations on traveller's behalf as we do not have the license to perform any Travel Agents duties. We thank you for your understanding. Regular courses are held in Korea Plaza every month for the public to learn more about the Korean culture. These courses include Korean language classes, K-pop Dance Classes and Korean Food Making such as Kimchi Making, Tteokbokki Making (Korean Spicy Rice Cake) and more! To find out more about our updated activities, check out "What's Happening", and "like" our Facebook page. You can also subscribe to our monthly e-newstletters by clicking here. Occasionally, Korea Plaza plays host to popular Korean celebrity visits and fan club gatherings. Korea Plaza has been visited by some of the hottest K-pop stars like Kim Jeong Hoon, Kim Gang Woo, FT Island, T-Max and Brown Eyed Girls. 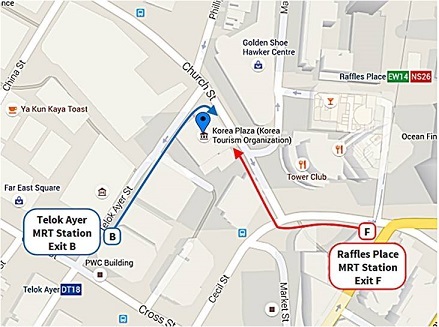 If you would like to hold your Hallyu Fanclub gathering in Korea Plaza, please email us at singapore@knto.or.kr. Visitors to Korea Plaza can try on our wide array of Hanbok (Korean traditional costume) and take pictures at our Photo Area at no cost. We work with travel agents as well as airlines in the development of new tour itineraries and regularly produces press releases to ensure that new developments are constantly communicated and updated to the media. JOB DESCRIPTION In charge of promoting Korea's tourism in Singapore. "In charge of promoting Korea's tourism in Singapore. I want to make Korea as the best tour destination for Singaporeans while introducing unique Korean culture, food and many tourist attractions." "I love to be in Singapore!!! I love meeting new friends, new food and new culture. Being in Singapore, I can do all of the above!! " JOB DESCRIPTION SIT Marketing for Singapore market. Operating Korea Plaza events and activities. Administration and Accounting. "Hello Singapore! I am very excited to introduce beautiful and fun country, Korea to you. Please do not hesitate to visit Korea Plaza at any time. You can learn Korean language, cook Korean food, even dance KPOP. Korea is wating for you!" "I love uncovering the hidden gems in Korea and love the super IT wonderland with the latest IT gadgets and innovations." JOB DESCRIPTION Business Development, Advertising & Promotions, Travel Trade and Media Management, Event Management for sunny Singapore and lots of etceteras! "Annyeonghaseyo! Me? A simple girl who is in love with Korea, the country, the culture, the dramas, the movies and of course the music!! I am glad to be part of the team to promote Korea to you!" JOB DESCRIPTION In charge of Free & Independent Travel sector, event management, WAH! Korea Club, etc. From the food, the entertainment scene to the culture; I’m a person who has an interest with all things Korea. Every trip to Korea for me, it’s like an exciting adventure of uncovering the country’s hidden gems. I’m grateful to be part of this team and hope that I can spread some Korea awesomeness to you. JOB DESCRIPTION Handles daily operation of Korea Plaza, WAH! Korea Club, Education travel enquiries, etc. "Korea trips never fail to thrill me from food to the scenes. Every visit something new will bound to excite me. Hope every traveller will get to feel the same!" JOB DESCRIPTION Attend to visitor enquiries and running of Korea Plaza operations. Always ready to assist you with any enquiries about Korea! I look forward to seeing you at Korea Plaza! It is good to meet and assist people who love Korea. I hope you all enjoy our culture and attractions. Thank You!